Most of my friends are not fruity-drink drinkers. In general, they are wine and beer people, and they can put away quite a lot of that liquid refreshment. I have, one more than one occasion, been simultaneously shocked and amused when our huge, blue, regular-trash-can-sized recycling bin has ended up nearly full to the brim of bottles and cans after having friends over. I’m just glad that it has a lid so that I’m not embarrassed by having to leave the hard evidence of our excesses out in the open for all of the neighbors to see. Again, despite their propensity for consuming copious amounts of adult beverages, my friends aren’t usually particularly excited about things like frozen drinks, so when my husband and I were grocery shopping for a big cookout last August, I should have known better than to be enticed by the 4-for-$5 sale on 1-pound packages of strawberries. But I could make strawberry daiquiris with them for the cookout! They were so cheap! Oh yes, also, they looked and smelled amazing! I didn’t have the willpower to resist such a good deal on such good-looking seasonal produce. I took my four pounds of strawberries home and did the wash / dry / freeze on a tray so they don’t stick together / dump in a plastic bag thing with them. At the cookout, after some of our guests humored me and politely drank one daiquiri, they all switched back to their beer and wine. I think we polished off one pitcher of daiquiris and threw the second one away after it melted to watery grossness when no one wanted any more. And that is how I ended up with two large ziploc bags of strawberries in the freezer. Later in August, I managed to put a dent in some of the leftover berries by making some balsamic strawberry ice cream, but then I forgot all about them until I was cleaning out the freezer a few days ago. I tasted one and it was surprisingly un-freezer-burned. But here was my problem: it’s the middle of winter so I have no desire to make anything cold like ice cream or a smoothie, but I loathe the texture of frozen strawberries that have been defrosted. For me, that texture is spit-it-out bad, right up there with getting a chunk of unexpected fat in your mouthful of meat, or taking a nice big bite out of a soft, mealy apple. So, I started thinking about the strawberry purée from the ice cream recipe. It was packed with flavor and basically like a super-thick syrup. I redid the purée, cutting back on the sugar a little bit and swapping out the balsamic vinegar for pomegranate molasses, which makes it decidedly tart. I used it like a jam to sweeten some winter-y dishes and add some summer flavor to them. Truth be told, calling it a sauce is not really accurate because it’s not thin enough to be pourable. “Goo” might be the best word to describe its consistency, but that doesn’t really make you want to eat it, so I’m just going to stick with “sauce.” I tried using the sauce mostly in breakfast dishes with different winter fruits, and the three suggestions below were my favorite. 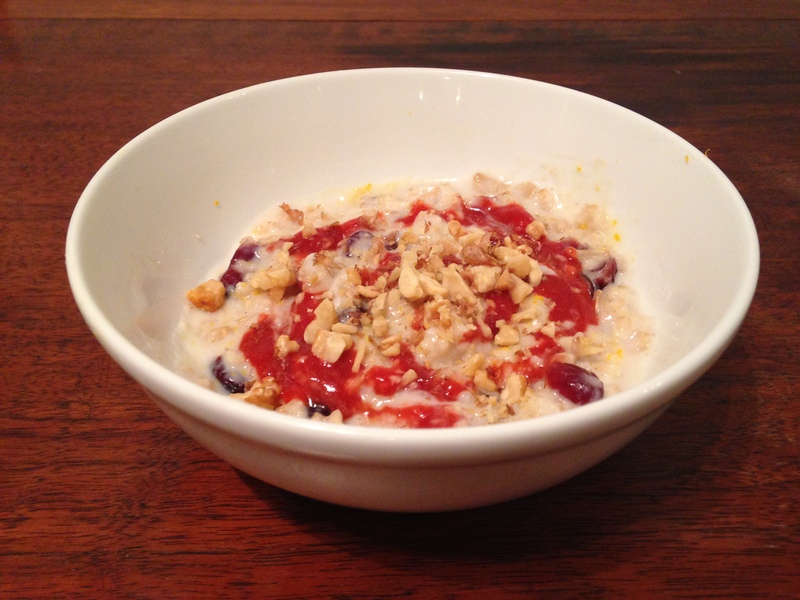 Cranberry-Orange Oatmeal with Strawberry-Pomegranate Sauce and Toasted Walnuts. Here, I basically used the sauce instead of sugar to sweeten my oats. Cook 1/3 cup old-fashioned oats with 1/4 c. water, 1/2 c. milk, a pinch of cinnamon, and 2 Tbsp. dried cranberries. After 5 minutes, when the oats are all nice and creamy, stir in 1/2 tsp. grated orange rind and 1/2 to 1 Tbsp. 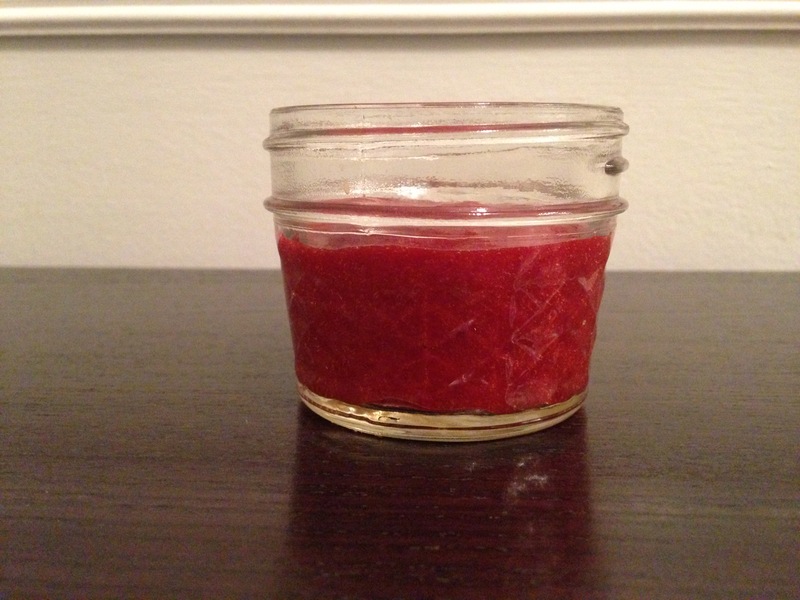 strawberry-pomegranate sauce. Top with chopped toasted walnuts. 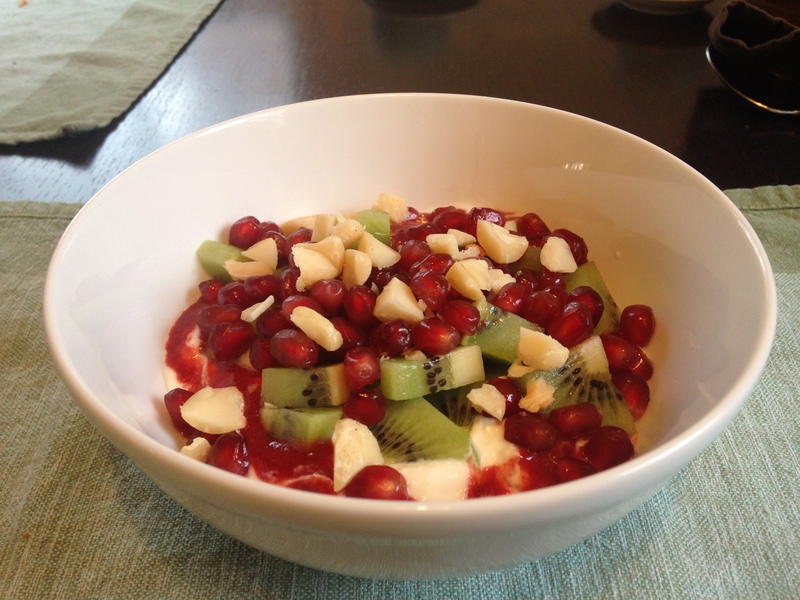 Double-Pomegranate-Kiwi Yogurt Bowl with Macadamia Nuts. Here, again, I essentially used the sauce instead of honey or another sweetener to mix in to plain yogurt. I really liked the super-crunchy texture that the kiwi seeds / pomegranate seeds / toasted nuts combo created. Swirl 1/2 to 1 Tbsp. strawberry-pomegranate sauce into 1/2 cup to 3/4 cup plain Greek yogurt. Top with 1 peeled and chopped ripe kiwi, a handful of fresh pomegranate seeds (okay, okay, pomegranate “arils” if we want to be technically correct), and a tablespoon or two of chopped toasted macadamia nuts. 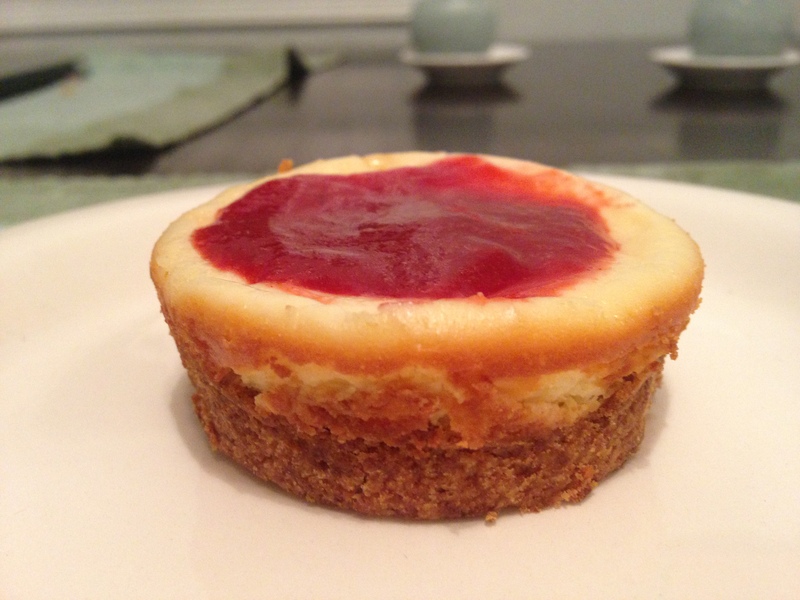 Lastly, you could put a spoonful of the sauce on top of some cheesecake. Or a mini cheesecake. Classic and yummy. Note: The sauce is based on the fruit purée for the Balsamic Strawberry Ice Cream in the book Sweet Cream and Sugar Cones by Kris Hoogerhyde, Anne Walker, and Dabney Gough. (Which, by the way, is a great ice cream recipe.) I did not want the sauce to be super sweet, but you might adjust the amount of sugar depending not only on your taste but also on how sweet your berries are to begin with. I got my pomegranate molasses at a Lebanese market, and it’s sold at some Asian supermarkets. After a quick Google search, I also found out that you can apparently make it at home by essentially reducing a mixture of pomegranate juice, sugar, and lemon juice. Or, like practically everything else, you can find it on Amazon. 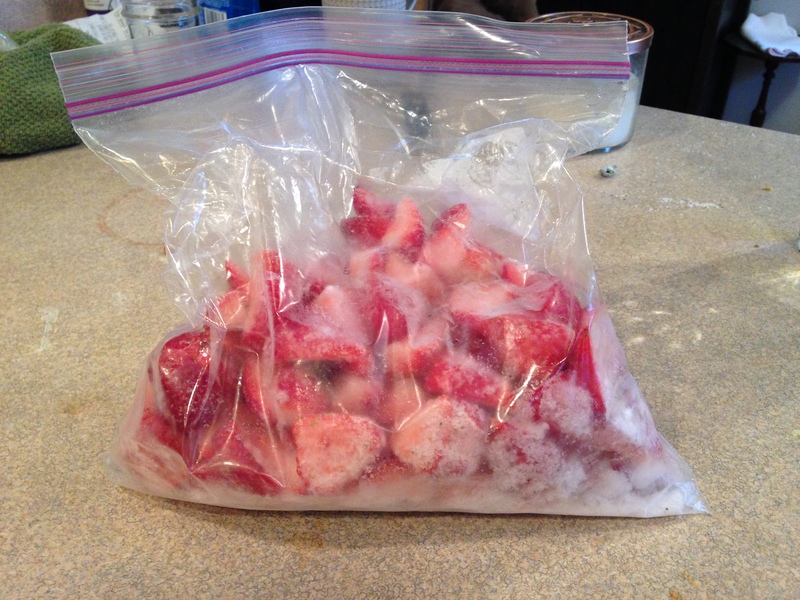 No need to defrost the strawberries. Cook them with the sugar in a medium skillet over medium-low heat, stirring occasionally, until they have softened and released a bunch of juice, about 10 minutes. Turn the heat up to medium and cook for another 6-8 minutes, or until the mixture has a syrupy consistency. Let it cool down some, then purée in a small food processor. Pass through a fine mesh strainer, then add 1/2 Tbsp. pomegranate molasses. Taste, and add the other 1/2 Tbsp. if desired. Transfer to a small container, and cover and refrigerate until needed.